Almost ten years after I completed the Crisp Building mural and about five years after it was all but hidden from view, I've been asked to 'fix it'. It's really kind of hard to see in the photo I took just today, but there's an area just above the right arch where the stucco fell off the building. Funny story about that stucco....(I have tons of them.....stories, that is). Back when I was hired to paint the mural, I made the decision to use a special 'paint' that doesn't fade....or isn't supposed to fade for something like 80 years. For some reason, it's not made in this country and back in 2000, I could only purchase it through a distributor with ties to the factory, located in Germany. It took forever to get the paint...probably arrived by way of that proverbial 'slow boat to China'. A month or so after I started on the mural, I was interviewed by our then art critic, Joan Altabe. I made the mistake of telling her something that was told to me by someone close to the owner of the building, which was that, "I may as well use just any old paint since the stucco on the building will fall off before the paint arrives". They printed that in the Trib. Oops. So the stucco....it fell off:-) It's really hard to see in the photo, but that entire part about the horizontal bar just above the right arch up to the fifth floor is where it let loose. 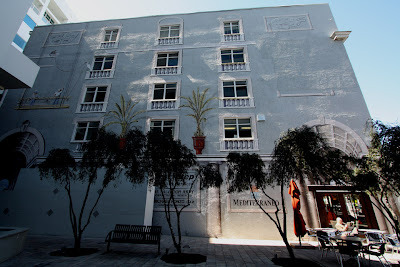 The stucco has been repaired and repainted with that kind of drab gray for a few years now. I have to replace the old border that was around the title of the building, repaint the title as well as the white cornice that runs across the building between the fourth and fifth floors. I'll probably touch up around the door that was punched through the right arch as well.